At least actor Sean Penn recognizes his true worth as a journalist. As he noted in his Rolling Stone piece on meeting and (sort of) interviewing fugitive Mexican drug lord Joaquin "El Chapo" Guzman, he does not ask for money for his (sort of) journalism. He's not a journalist, but he plays one in Rolling Stone, to paraphrase an old TV commercial. Of course, as an overpaid actor, he can afford to forgo payment. Laura Italiano at the New York Post takes Penn to task. 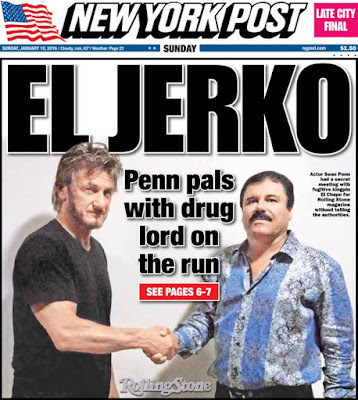 Hollywood blowhard Sean Penn secretly met, interviewed, and posed for grip-and-smirk selfies with murderous druglord Joaquin Guzman Loera — even as the world’s most-wanted fugitive continued to elude authorities in the months after tunneling out of a Mexican prison. ... In breathless, first-person prose, Penn marvels over El Chapo’s humble, hardscrabble childhood spent harvesting in the drug fields of Sinaloa state. ... But Penn was not afraid. Note To Penn & Rolling Stone editors: DEA stands for Drug Enforcement Administration, and not as Penn writes, the Drug Enforcement Agency. Perhaps U.S. justice department can prosecute the a**hole. Well, perhaps not the current administration's functionaries. There is, however, some kind of karma that will eventually catch up to this creep. Perhaps film producers will "black list" the SOB. I'm not sure he committed a crime - unless you call his writing and reporting a crime against journalism (Ha). Movie viewers have sort of "blacklisted" the actor, as his last film, "The Gunman" tanked at the box office. I saw the movie on cable and thought it was awful. Despite being a jerk, he can be a very good actor. He was very good in "Mystic River."